An upcoming print this season is the cowprint. Back from the 90's, and i remember all the cow printed backpacks and soft cusions when i was a kid. 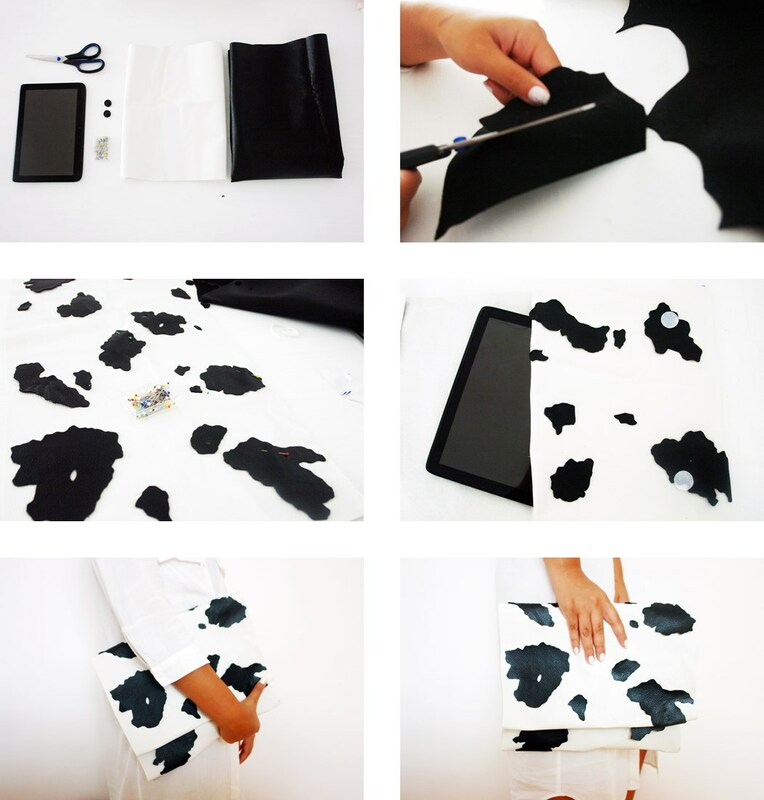 I was in need of a clutch for my tablet so a good reason to create a new clutch with a trendy cow print. 1: You need: Leather black and white, Siccors, Pins, a sewingmachine, and some buttons or velcro. 3: Cut a long piece of white leather wich you can fold 3 times so you have a simple flap clutch. Put the cow spots on the white leather and pin them together white some pins. When all the spots filled the white leather, sew the spots with your sewingmachine. 4: After you sew all the spots you fold the long piece of leather 3 times. sew 2/3 of the bag together where you can put your tablet or items in. 5: Now you can put some snap-buttons or velcro on the inside of the flap and on the bag so you can close the bag. 6: Howdy! Now you can put all your favourite items in the cow clutch! So what do you think of the cow print trend? Super super super cool! I wanna! Oh wow this is amazing! !